There were 670 press releases posted in the last 24 hours and 153,493 in the last 365 days. Spend time discovering all the cool ways engineering and engineering technology influences the world around us with fun activities designed by the Ontario Society of Professional Engineers from March 11-15th! A free robotics competition for 8-17 year-old students to be introduced to building, programming and racing skills and while competing and winning fun prizes! A half-day workshop that will introduce youth participants to the importance and challenges of designing sustainable cities, lead them through a hands-on design process, and conduct a STEM integration activity. Enjoy an evening of comedy, inspiration and networking with some of the top female leaders in the tech industry. The panel discussion will be followed by a screening of an IMAX documentary. All are welcome to this free event! In an era where Engineers are tasked with making decisions that affect the future of humanity, how are we giving them the tools to make ethical choices? Get a sneak preview of filmmaker Pietro Gagliano's vision followed by a moderated discuss with 5 leaders in STEAM. 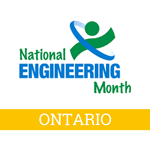 Brought to you by founding partners: Professional Engineers Ontario (PEO), the Ontario Society of Professional Engineers (OSPE) and the Ontario Association of Certified Engineering Technicians and Technologists (OACETT) and 30 colleges, universities and sponsors.